Simpsons-Sears model 10656 AM/FM stereo clock radio with jumbo LED display. Made in Hong Kong in the early 70's and imported by the Simpson-Sears chain of Canadian retail stores affiliated with Sears Roebuck. Not visible on the top is the Sears Electronics "atom" logo. 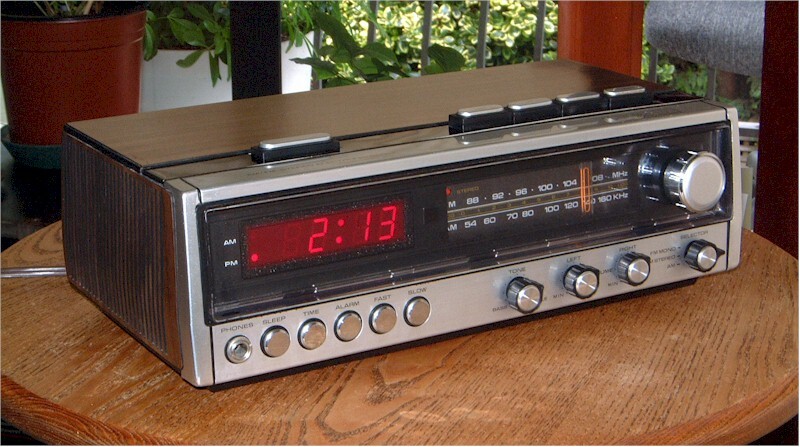 The LED clock is driven by a National MM5397, and the radio is all transistors with twin speakers. FM reception was via the AC cord though an external antenna could be connected. The buttons on top are Snooze, Dimmer, Alarm/Radio, Auto, and Power. The design is typical of the early 70's. The stereo feature and 1/4" headphone jack are unusual, as is the provision of LEDs for both AM and PM. The alarm sound is derived from the AC line and may be silenced for 10 minutes with the snooze button. As was typical for HK electronics of this vintage, the clock buttons and radio controls got scratchy.